A significant fire has occurred involving a Delta IV class ballistic missile submarine, the 'Yekatarinburg,' while in a large floating drydock at the port of Roslyakova. This class of submarine is reportedly powered by two 90 MWt two-loop pressurized water reactors. The Russian Navy reports that the reactors were shut down (and I'm sure they were before the floating dry dock was raised) and that no damage has occurred. No weapons were on board the submarine. Reports indicate that non-compliance with maintenance procedures in the dry dock probably caused the fire. The fire may have involved anechoic coating on the submarine exterior. The floating dry dock was partially lowered (submerged) to help stop the fire. The fire was apparently entirely external to the submarine. Reports of injuries are mixed, and unclear. A number of good reports are out on this event, and I'll link these below. There is also an AP report on this 'favorited' at the APR YouTube Channel. As of this moment, rather expectedly, nuclear impact is zero. Unless the seawater supply hoses to the boat were severed or seawater cut off, there would be no impact to reactor cooling. Labels: "delta IV", "SSBN", "submarine"
Looking at yesterday's APR update, as well as the APR tweets it's clear that there is a lot going on regarding the nuclear plant situation in Fukushima Prefecture, Japan. It is now possible to make a more thorough update which includes a number of areas of interest. FUKUSHIMA WILL REFUSE FURTHER NUCLEAR PLANT OPERATION. Various news outlets in Japan, including NHK and Kyodo have now reported that the Fukushima Prefecture Governor, in a meeting with TEPCO officials, has stated that he will not allow further nuclear plant operation in Fukushima. The impact on TEPCO will be considerable. Not only does this mean that TEPCO will be dismantling and scrapping the four damaged plants, it means all of them in the prefecture. This includes two more at the Fukushima Daiichi site and still four others located to the south at the Fukushima Daini site. Japan May Abandon Ten Nuclear Plants. The above article's total figure is staggering, especially when one realizes that TEPCO cannot derive any electric generating revenue from the six plants it will now be tearing down which are not at the end of their normal economic lives. FUKUSHIMA PLANT STATUS AND FUTURE. Fukushima Daiichi No. 1, No. 2, No. 3: All three plants experienced serious reactor accidents and are in a prolonged process of control, mitigation, containment, cooldown, and decommissioning. Fukushima Daiichi No. 4: This plant was damaged by secondary causes from the other plants and will be decommissioned. Almost no damage occurred to nuclear fuel at this plant, all of which was in the spent fuel pool. See here for details. Fukushima Daiichi No. 5, No. 6: These two plants received some tsunami damage but no secondary damage from the accidents at the other plants, being sited far enough north to be spared. However, it is a practical certainty these plants would never have restarted and now with the Fukushima Prefecture decision, they will also be decommissioned. Fukushima Daini No. 1, No. 2, No. 3, No. 4: This separate nuclear generating site is somewhat south of Fukushima Daiichi and did not receive as much quake and tsunami damage. With the new Fukushima Prefecture decision, these four still operable plants will now be decommissioned. There is now a very seriously thought out body of evidence which TEPCO has presented to the world concerning the actual status of the reactor cores, reactor pressure vessels, primary containments (dry wells) and reactor buildings of the three Fukushima Daiichi plants that have experienced reactor accidents. TEPCO has produced a long and somewhat complicated video describing this work in detail. TEPCO video covering present (Nov-Dec 2011) reactor damage status @APR YouTube. The conditions can be summarized briefly, and are helped by the following illustration I have prepared. Fukushima Daiichi No. 1 - Most of the fuel has been destroyed by melting. Most of the fuel has exited the reactor pressure vessel and has deposited in the area of the dry well directly below the reactor, inside the reactor support pedestal area and in the drain sumps. This fuel did cause a corium-concrete reaction whose effects in terms of gases given off were only all too obvious during the accident. This fuel has not reached the dry well wall; the reaction is stopped; the mass of fuel is properly cooled. Around 25 feet of depth consisting of reinforced concrete remains underneath the dry well and some further depth of concrete inside the dry well under the melted fuel mass. About one foot of water covers the melted fuel mass in the dry well. Fukushima Daiichi No. 2 - Most of the fuel is still inside the reactor pressure vessel with a majority of it melted and relocated. Some melted fuel has exited. 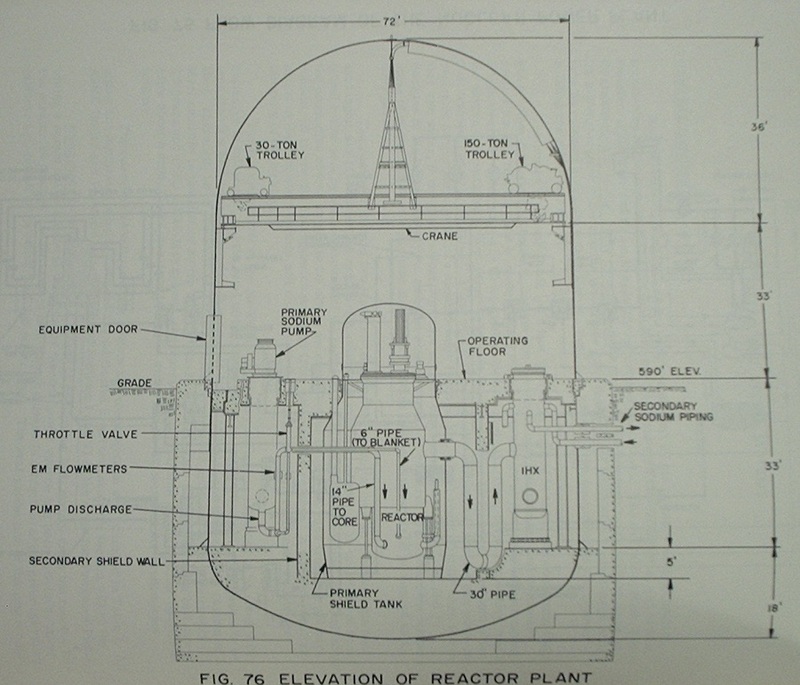 Water level inside the reactor vessel is not detectable due to proximity of water legs to heat. Water level in the dry well is not known but is estimated to be deeper than that at No. 1 and less than at No. 3. The core is suitably cooled by feed flow and core spray flow. Fukushima Daiichi No. 3 - Most of the fuel is still inside the reactor pressure vessel with a majority of it melted and relocated. Some melted fuel has exited. Water level inside the reactor vessel is not detectable due to high radiation preventing work. Water level in the dry well is perhaps almost half way up the large spherical dry well chamber. TEPCO TO SCOPE NO. 2 PLANT: There are reports on NHK that beginning soon, TEPCO will prepare to insert a television camera using a device like an endoscope which is only 8mm wide into the No. 2 plant dry well to attempt to view the conditions inside. This will be the first actual visual assessment of the interior portion of any of the three damaged reactor plants. This about covers the present situation. I highly recommend viewing the TEPCO video linked above if you have nuclear experience; persons without will still find it of interest but perhaps a bit dry. Finally, there is a further "tour video" of the Fukushima Daiichi site now uploaded at the APR YouTube Channel. There is no description, and captions are in Japanese, but the site views are worth seeing... I've provided some description in the caption below the video to detail what's being shown. Click here to see the Fukushima Daiichi tour, December 2011 @ APR YouTube. UPDATE: I've been informed by a friend of mine in a position to know that the estimates I've given above, and also probably some others floating around, for the decommissioning cost of the Fukushima plants are probably quite low in point of fact. He gives the example that Connecticut Yankee, a single reactor (Westinghouse two loop PWR) cost over $800 million to decommission. See here for information on the decommissioning process of Connecticut Yankee. Labels: "core damage", "dry well", "fukushima daiichi", "spent fuel", "TEPCO"
-TEPCO will conduct an examination of conditions inside the containment (that is to say inside the dry well) at Fukushima Daiichi No. 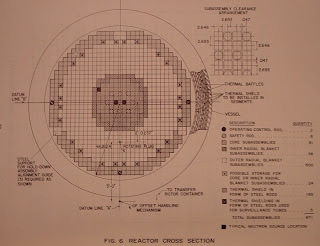 2 reactor plant using a long flexible scope. This television apparatus will be inserted through holes drilled in the building and containment next month. This is the first serious attempt to direclty ascertain the conditions inside the dry well and perhaps the condition of the lower end of the reactor pressure vessel. Previous attempts to determine conditions indirectly all failed. -The Governor of Fukushima Prefecture has apparently told the TEPCO president that he will permit NO further reactor operation in Fukushima Prefecture. This will mean the decommissioning not only of the undamaged Fukushima Daiichi No. 5 and No. 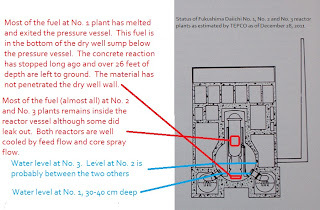 6 plants (which this author predicted many, many months ago) but also the four intact and undamaged reactor plants at the Fukushima Daini generating station. This could of course place TEPCO in a further state of economic distress as it now will be unable to generate any revenue by operation of Fukushima Daini and will in fact be forced to undertake not only the operation to decommission four damaged plants, three with serious reactor accidents, but also now six undamaged but complete reactor plants - four of which are at a completely separate site. If this plays out as written now, it probably (in this writer's eyes) means further serious economic problems for TEPCO. TEPCO continues to deny rumors of nationalization. Further details on both as they are available. Once again Atomic Power Review is proud to host the rotating Carnival of Nuclear Bloggers - this, the 84th edition. This feature travels around to the best nuclear blogs in the English-language world of nuclear energy, and presents the best and brightest pro-nuclear authors every week. Many times I have indicated to regular readers here at APR that this Carnival is the best single way to get an instantaneous snapshot of what is going on in the world of nuclear energy, and this week (even though deep in the holiday season) is no exception. And, once again, before getting to the listing of Carnival contributions, I have to ask you "What is this?" and present something you may or may not be able to identify. The answer and much more will appear below the listing of Carnival entries. So... what is this? A somewhat cleaner and cheaper coal to liquid fuel process. One pathway would use nuclear power for the conversion. Brian also submits this ROUNDUP of nuclear news. Jeff's post on the anniversary of the first electric power generation from nuclear energy is well worth a look! Meredith kindly points out that I linked to this post at YVY in a later post at APR which looked forward to NNSW with added information; see here for that post. I do have to thank Meredith for polling the American Nuclear Society Social Media list for the resources she included in her post, and for checking all of them out. Jim Hopf at the ANS Nuclear Cafe analyzes and evaluates the serious issues raised by NRC Commissioners concerning NRC Chairman Jaczko, which spilled over into the political arena and into Congressional Hearings last week. And no Christmas Eve edition of the Carnival would be complete without a (soon-to-be) classic Yuletide poem to capture the spirit of the season, by the almost-anonymous A. Priori at the ANS Nuclear Cafe. Given the flare-up at the NRC that was made public in the last couple of weeks, Gail Marcus reminisces about the past, when she served as a Commissioner's assistant during a time when the Commission truly functioned as a collegial body, in accordance with the intent of its charter. Although there were differences of opinion, she recollects an atmosphere that was generally open and cooperative. Since we celebrated the 60th anniversary this past week of one of the very biggest milestones in nuclear power history--the first production of usable quantities of electricity at the EBR-I in Idaho--Gail Marcus returns to a discussion of historic events (started earlier this month) and puts the event in context with some earlier milestones and achievements. US Areva CEO Jacques Besnainou joined the monthly conference call with nuclear bloggers. In response to a question from Dan Yurman, he said that the firm would restart the construction phase of the Eagle Rock Enrichment Facility in Idaho by late 2013 or 2014, or whenever investment funding is found for the project. Also, Besnainou provided an update on the progress of two EPR reactors being built in China. Click here to see Dan's article. I would also like to congratulate Dan on setting some new page view records on the Idaho Samizdat blog! That's it for our Carnival rides this week... and now it's time to tell you what that was you saw up there at the top of this post. This smallish nuclear power plant is significant because of our recent focus here and on other sites on anniversaries ... the anniversary of this plant's first criticality was at the beginning of December 1956, with a buildup or ramp up to full rated power on December 29th, 1956. 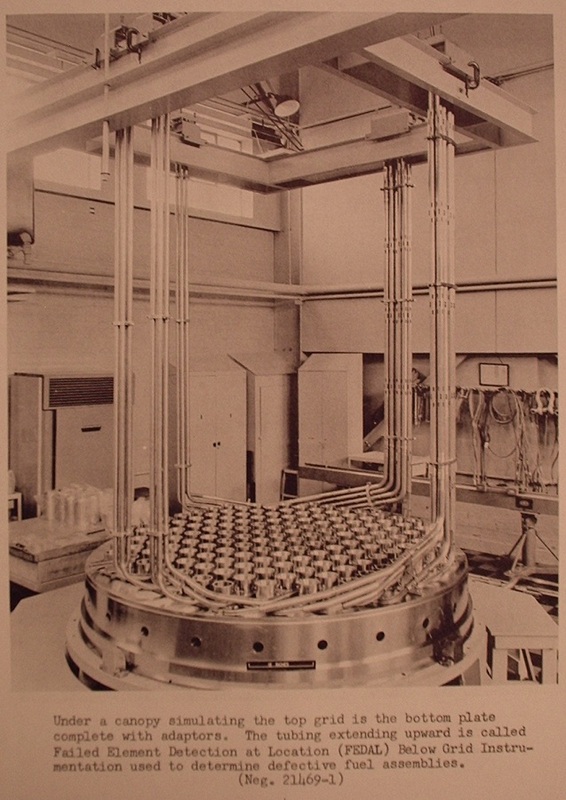 This plant is the EBWR or Experimental Boiling Water Reactor, constructed at Argonne National Laboratory. Let's take a look at a few other illustrations of this plant; we'll start with AEC publication TID-4562. Above, we can see the layout of the plant. 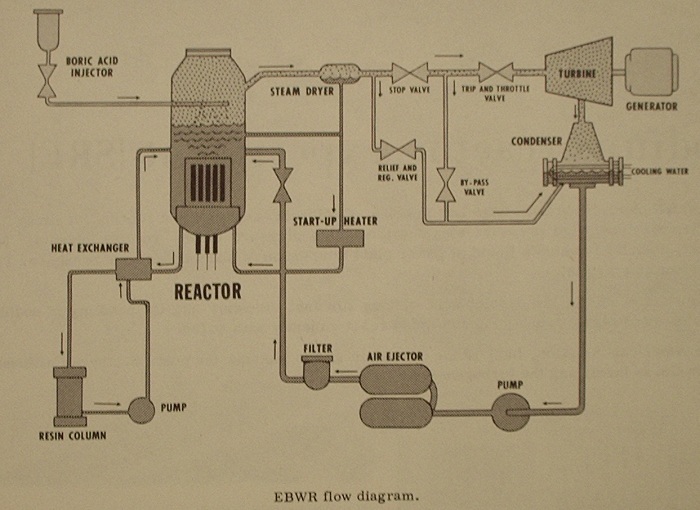 The first experimental boiling water reactor of this series was an EBWR prototype, built at NRTS Idaho. The plant we see here took lessons from that prototype. 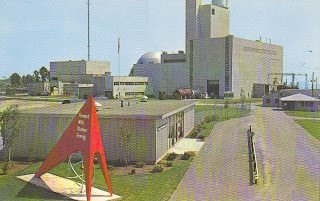 The EBWR was designed by Argonne National Laboratory; the plant architect-engineer was Sargent & Lundy, with Summer Sollitt Co. acting as general contractor. 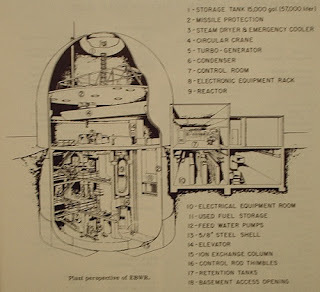 The EBWR was rated 20 MWt / 5 MWe initially when built. 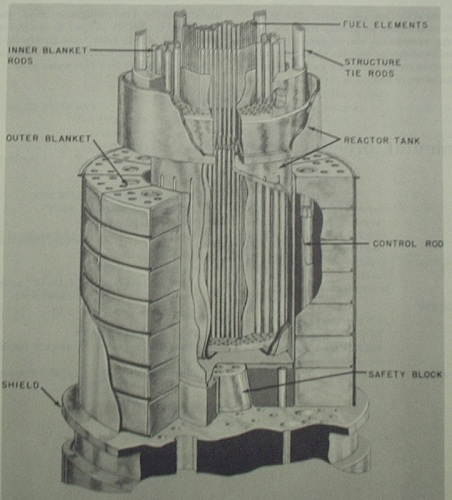 The original core contained both natural uranium and enriched uranium plates with Zirc-2 cladding. The core fuel loading was 4536 kg of natural and 66 kg enriched uranium. 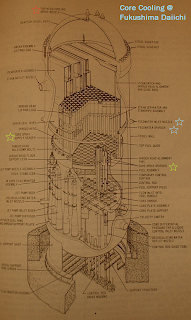 There were 77 of the natural and 36 enriched fuel elements in a core structure 4 feet in diameter and 4 feet high. 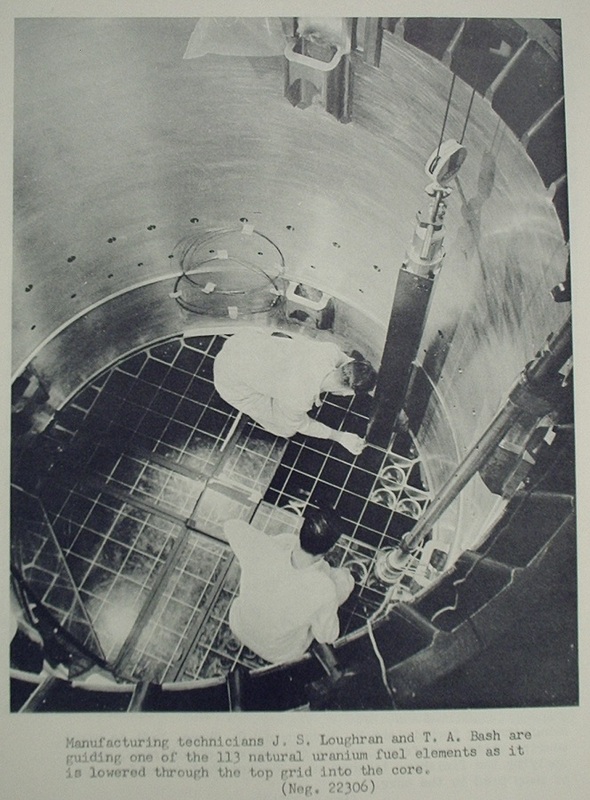 Above, we see a view from TID-4562 (partially ghosted, as published) showing the installation of the pressure vessel in the EBWR reactor building. 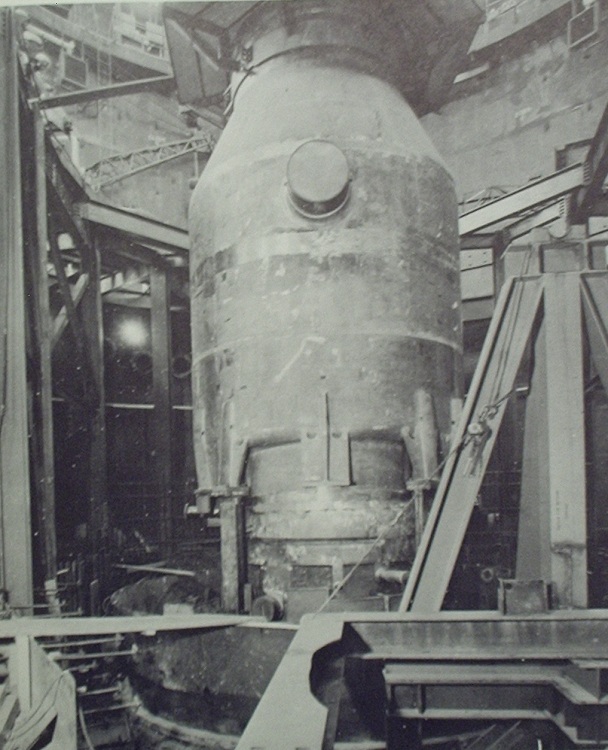 According to "Nuclear Reactor Plant Data 1959" published by the ASME, this vessel was constructed of SA-212 Gr. 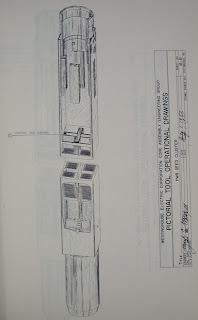 B steel, had an 84 inch inside diameter, and was designed for 800 psig and 650F. Above, simplified flow diagram for the EBWR. Finally, above we see the operating floor of the EBWR in an AP wire photo dated February 2, 1957. On the left we see the plant's turbine generator, which was constructed by the Allis-Chalmers Manufacturing Company. According to the ASME data, the nameplate rating of this machine was 6250 kw; however, the plant's maximum capability (input to the turbine) resulted in a 5000 kw rating gross, with 4500 kw net power left to supply facilities outside the EBWR plant. At full load, inlet pressure to the turbine was 560 psig with steam at a temperature of 482F. At full rated power and at the stated conditions steam flow to the turbine was 60,000 lbs/hr. This is probably the smallest Allis-Chalmers turbine generator set ever built as a main power unit for a nuclear power plant; the largest was probably that installed at Enrico Fermi Atomic Power Plant (Fermi-1), which we have seen before on APR. In the photo, the reactor is underneath the heavy looking steel structures nearer the center, while spent fuel storage is beyond this more to the right and rear. I hope you've enjoyed this week's Carnival and a look back at yet another plant well known in history that first went critical and then became fully operational in December. Today, the Nuclear Regulatory Commission has certified the Westinghouse AP1000 pressurized water reactor design. This is a significant milestone, and with this announcement by the NRC it's clear that the COL process for Plant Vogtle and V.C. Summer stations (two reactors each station) could be complete in the first quarter of next year. Here is the NRC's announcement on the NRC blog. Here is American Nuclear Society's "ANS Nuclear Cafe" post on the subject. Here is Westinghouse Electric Company's press release, including background and commentary. Labels: "AP1000", "licensing", "NRC", "westinghouse"
National Nuclear Science Week - this time, next month! Readers of this site have surely noticed the icon on the right side carrying the emblem of National Nuclear Science Week, which is a link to the website set up to get out the message about this important educational event. There is about one month left until NNSW; it runs January 23 to January 27; five school days worth of possibilities for our educators to get nuclear science into the schools. Are you an educator, or school administrator? Are you prepared for this opportunity? Do you have resources in place? It is NOT too late. You can click here to get to National Nuclear Science Week's site where educational resources are available. You can click here to access a wonderful compilation of high school level educational resources compiled by Meredith Angwin over at Yes Vermont Yankee. You can look at the extensive link list on the right side of Atomic Power Review's pages; many of these links have content that can help develop a lesson plan or answer questions. Also, many of the bloggers can and will answer questions sent via comments or via e-mail. The American Nuclear Society can provide speakers with enough advance notice if any are available in your area, and has materials available on line. Here is one link. There is also "About Nuclear," set up by ANS. Click here to see that site. So there it is. One month.. plenty of time.. and quite a number of resources. APR will be hosting a special article each day on the relevant topics as well, and I have a feeling a number of other pro-nuclear blogs and sites will be doing so too. Get ready! 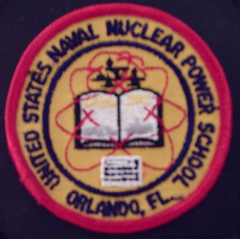 Labels: "education", "national nuclear science week"
Yesterday and today mark an important event in nuclear energy history; these two days are the span during which the EBR-1 reactor plant, which was located at the National Reactor Testing Station, Arco, Idaho, generated useful electricity for the first time. The plant was slowly brought up to full power over a two day span; there was a famous moment the first day (December 20, 1951) on which the plant's turbine generator powered four light bulbs, while on the second day the turbine generator supplied all the plant power needs. Dan Yurman, who worked at the NRTS (later, INEEL) for many years has an excellent posting on Idaho Samizdat which includes two videos. Click here to see his post; I highly recommend it. Now, to be clear, in those years there were a number of "firsts" and a number of claimed firsts. 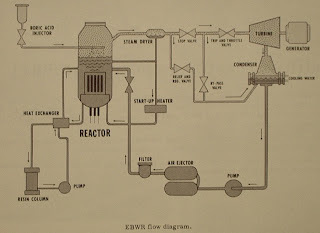 The event we're talking about at EBR-I was the first generation of useful power to do work by a nuclear reactor plant. This was, of course, in the form of electricity. Let's take a quick look at a "firsts" timeline to get a better perspective overall; this is a generalized timeline I constructed myself a long while back for general reference. December, 1957: Shippingport Atomic Power Station on line with Duquesne Light Company. First US full scale nuclear generating station; also, this was the first commercial nuclear generating station announced and ordered. 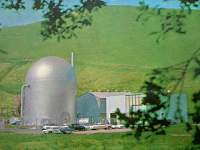 GE quickly rushed the Vallecitos experimental reactor (preparation for Dresden station) and got a contract with PG&E to distribute the power to beat Westinghouse / Duquesne Light with Shippingport. December, 1961: Nuclear powered ship NS Savannah achieves criticality. That's a pretty solid, if brief, early timeline. At some point I'll publish the entire timeline, but these are the highlights. Now, let's get back to the anniversary at hand with just a quick technical look at the EBR-I plant. 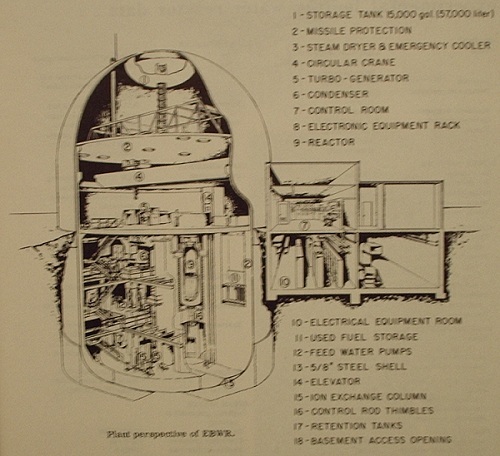 EBR-I was a liquid metal and air cooled experimental fast breeder reactor. It was designed by Argonne National Laboratory, which at that time was the principal design bureau for the AEC. The Austin Company acted as architect-engineer, with Bechtel Corporation building the plant. 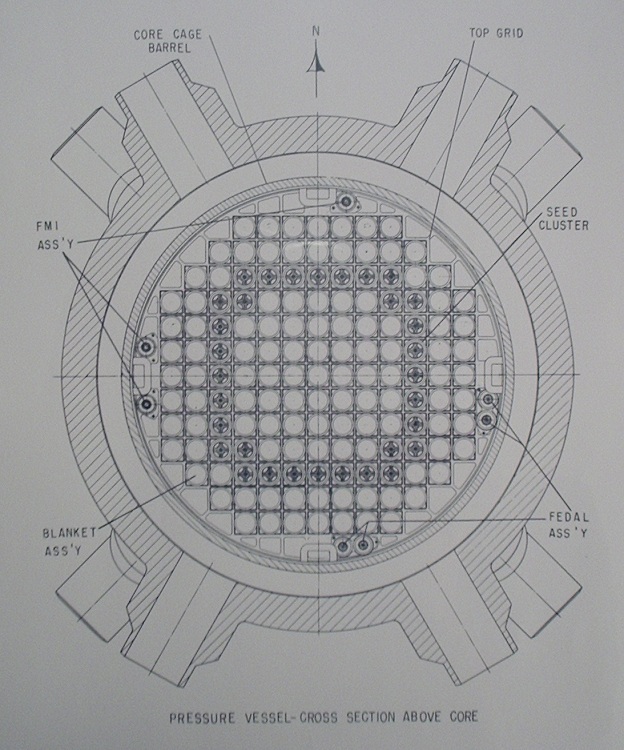 The purposes of this plant were quite simple; it was supposed to test various breeding core designs (breeding means that you get as much or more fissionable material from core operation as you burn from the initial fissionable material loading) as well as work out various problems that were anticipated with metal cooled fast breeders. For those uninitiated, "fast breeder" means that the reactor is designed to sustain its chain reaction on fast fission - that is, the neutrons are not slowed down or 'thermalized' as they are in water cooled reactors. 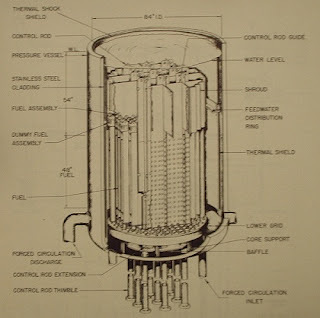 Below, we see some illustrations from a TID-4562, Experimental Power and Test Reactors, November 1956 which was published by the Technical Information Service of the Atomic Energy Commission. First, the entire plant in cutaway, with the external building omitted. Click to enlarge. 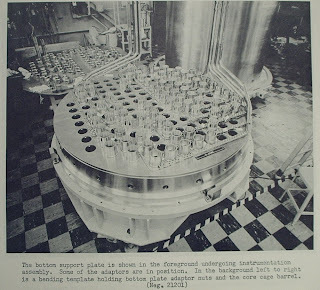 Caption from TID-4562: "The primary liquid metal coolant flows by gravity from the supply tank (top center) through the reactor core, from which it absorbs heat, and then to the heat exchanger, where it gives up this heat to the secondary coolant, also liquid metal. 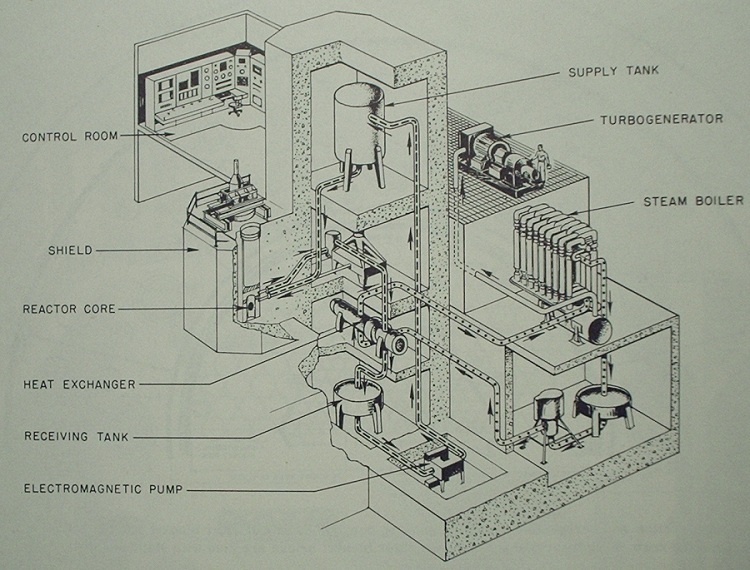 The primary coolant is returned to the supply tank by an electromagnetic pump (bottom.) The secondary coolant is pumped to the boiler, where it gives up its heat to water, thus generating steam. 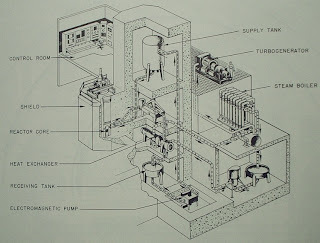 The steam then passes to the turbine, is condensed, and returned to the boiler by a feed water pump. 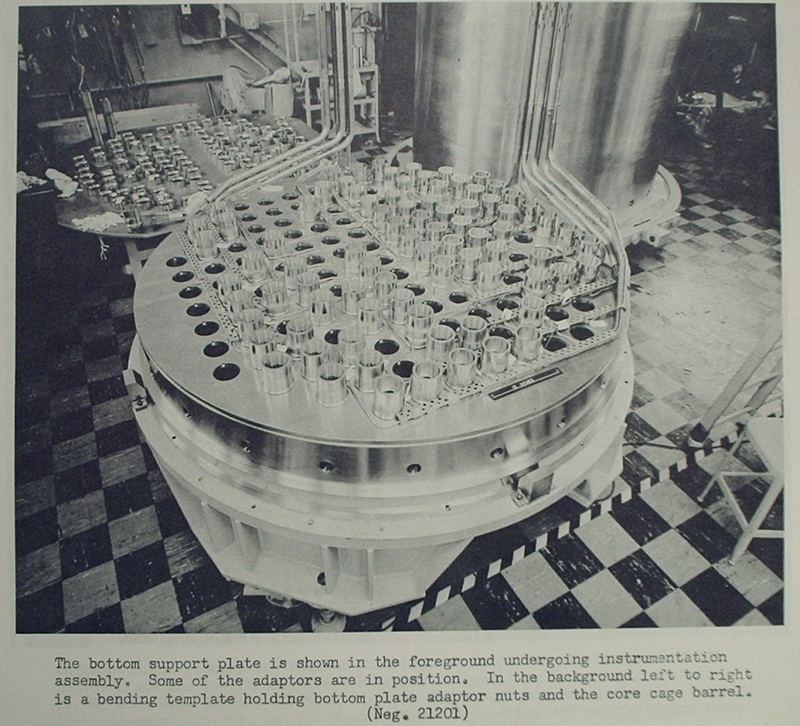 This plant used NaK (sodium-potassium) for both the primary and secondary (intermediate) coolants; in the initial core installation, the primary coolant entered the core at 442F and exited at 600F with a pressure maintained at about 100 psig. The NaK flow rate through the core was 292 gallons per minute. The outer blanket was cooled by air, with a total airflow of 5800 cfm. Data indicate that if the inlet temperature to the blanket was 37F the outlet temperature was 196F. The outer blanket of this core was movable on an elevator, and could be lowered to act as a control element. 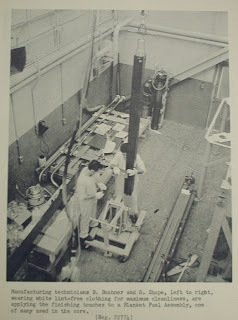 The core also had four regulating rods and eight safety rods. 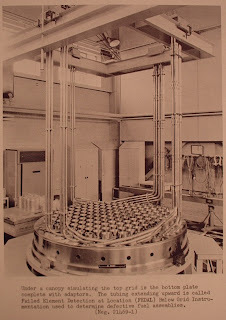 The primary NaK coolant in this core flowed down between the inner blanket rods, and then up through the comparatively tiny central reactor core. As mentioned, there was a double heat transfer circuit also using NaK as the intermediate coolant, and then water as the final coolant. 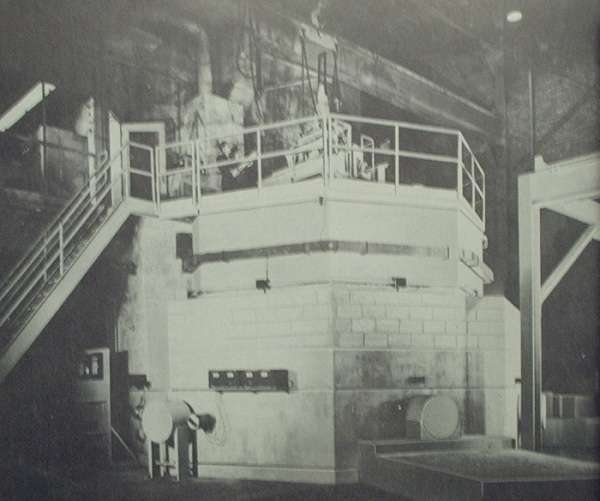 This steam generator produced steam at 400 psig and 3630 lbs/hr flow rate to drive the turbine generator which was rated 200 KWe. 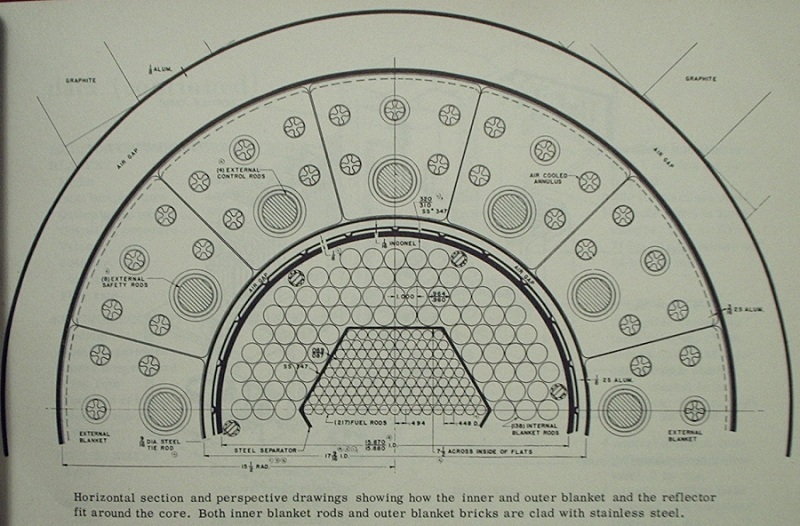 The total power of the reactor was divided; 72% of the total power was developed in the core, 14% in the inner blanket and 14% in the outer blanket. The total power rating of this core was 1400 KW. Finally we have a view of the reactor installation from inside the reactor building. Eight to nine feet of concrete shielding surround the reactor tank; the stairs at the left lead up to the control room for the plant. I hope you've enjoyed this commemoration, and a brief historical perspective. Labels: "anniversary", "arco", "EBR", "NRTS"
Radiation deaths in US due to Fukushima Daiichi: Nope. The major scaremonger behind the Radiation and Public Health Project, a dedicated anti-nuclear activist non-profit 501(c)3 corporation which pays this scaremonger $82,000 a year, has co-authored a paper which has probably set a new record for the rate at which it was totally torn apart by careful review. Actually, the review required to debunk it didn't have to be that careful. This report details the deaths supposedly associated with a radiation plume (sic) that hit the US after the Fukushima Daiichi accident. (Long time readers here might recall that the Los Angeles area air quality site had a radiation detection widget up for a month or two and took it down after never having detected anything.) The report was supposedly "peer reviewed," but since for people of this ilk the term "peer review" means that only a few like-minded and paid activists will see it before it's published the term is meaningless. The paper, likewise, has not appeared in any reputable medically oriented venue. I will give some links below to the paper itself first, and then some articles everyone might want to read in order to get a clear idea of who is at work here and what their agenda is... as well as just how lousy the science is. Heck, Mangano himself doesn't even back up the paper in interviews with both barrels. First we find a presentation of the paper in the International Journal of Health Services, which as Rod Adams has discovered really has less to do with health and more to do with an agenda. Here is the RPHP link. Here is the discussion of this "paper" by NEI NUCLEAR NOTES. Finally, we get a statistical dissection of how the data were manipulated by reading the fine article at The Capacity Factor. I have debated Mangano before and find even his basic knowledge of nuclear accident history to be not just seriously lacking, but populated entirely with lies. It's certain that this new study has already been subjected to enough withering review that its lies are also now exposed. What this author hopes most of all is that the "peer review" process that such disreputable "scientists" are using is exposed for what it really is and is not. Who reviewed this one... that's what I'd like to know. UPDATE 6:15 PM TUESDAY... Rod Adams at Atomic Insights has just posted another piece covering the paper in question, and it's well worth reading. Click here to read Rod's analysis. UPDATE 4:35 PM WEDNESDAY... Cheryl Rofer at Nuclear Diner has sent along a link to another dissection of the report. Click here to see it. Thanks, Cheryl! UPDATE 5:05 PM THURSDAY... Dan Yurman has tipped us off to the following story run on Vitals @ msnbc.com which further disassembles and invalidates the new "report." Click here to read this story. Thanks, Dan! Labels: "anti-nuclear", "fukushima daiichi", "peer review"
There has been a lot of bad press about the announcement by the Japanese Government that the reactors at Fukushima Daiichi have achieved a state of cold shutdown. I have tried to clear this up in a previous post, but since there does appear to be continued confusion in some media, I will make a couple of additional points. It was stated (and continues to be, in places) that the owner-operator of the Fukushima Daiichi site (TEPCO) and that the Japanese government have been less than forthcoming with information, and that operations on the site and effects off site have been covered up. This could not be further from the truth; simply look at all the posts on this site and all the videos on the APR YouTube Channel for this proof. To this end (that is, for the sake of transparency) a very detailed recovery timeline was developed and published widely by all concerned parties and continues to be used to this day. December 19, 2011... NISA website. "The Nuclear Emergency Response Headquarters evaluated that the reactors at Fukushima Daiichi NPS, TEPCO, were brought to a condition equivalent to "cold shutdown" and, even if an unforeseeable event occurs, the exposure dose at the site boundaries can be kept at a sufficiently low level as a result of the evaluation of the securing of safety at nuclear reactor facility of Fukushima Daiichi NPS, TEPCO, at the completion phase of Step 2, stating that a safe condition has been achieved and the accident at the NPS itself has come to be settled." So, the Nuclear Emergency Response Headquarters (this is a special construct of the Japanese Government) decided that the condition had been achieved, and it seems obvious to me that NISA and TEPCO would be included in this decision making simply by virtue of the complicated manner in which the Japanese nuclear industry operates. Thus, this is neither a unilateral nor simply a political announcement - it's technical. And it's mapped out on the timeline as a required step. -No condition of explosive hydrogen accumulation exits, with nitrogen purge to the reactors and primary containments and gas handling systems operating. -No condition of decay heat buildup in the reactors exists, with both feedwater system cooling feed and core spray ring feed in progress. -No condition of dose above 1 mSv/yr exists outside the nuclear power station. -No condition of wide uncontrolled atmospheric release exits with the reactors cooled down below 100C and thus no boiling occurring to disperse materials with steam. In the final analysis, this announcement is kind of like saying "I think I have caught a cold." You already had the cold before you knew it; the symptoms accumulated until as a group you put them all together to determine you were sick. This announcement is very similar; each of the contributory factors was reached independently of the others in ways, but tied together in ways so that the actual state of "cold shutdown" has existed for weeks. Only now did the nuclear response headquarters unit, NISA and TEPCO collaboratively decide that it was time to announce without doubt that this status had been achieved. What this means is detailed above; it could not be more clear what this means and does not mean. It also could not be more clear that there is no political advantage in making this announcement for anyone - it's a matter of plant status, and that's all. Here are some links that readers might find to be of interest. NRC Definition of "Cold Shutdown"
Below, a graph from Tokyo Electric Power Company showing core decay heat generation for all three Fukushima Daiichi reactors. In reality, "Fukushima Daiichi" is "Fukushima Number One" nuclear power plant site, and 1F is the TEPCO code for Fukushima Daiichi. Thus, 1F1 is Fukushima Daiichi No. 1 reactor plant, 1F2 is No. 2 and 1F3 is No. 3. 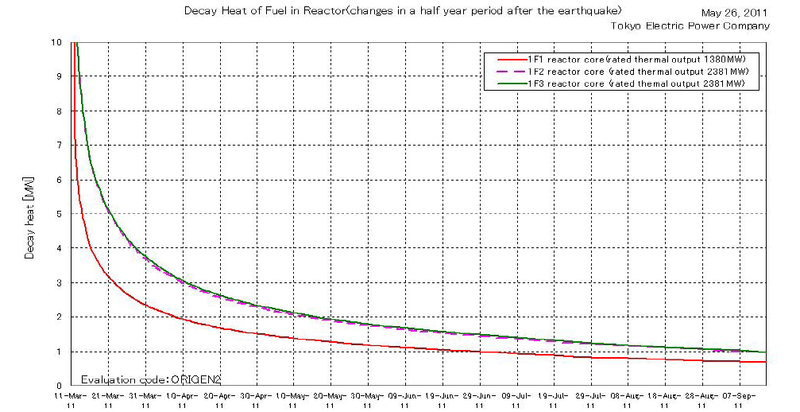 Note that core power due to decay heat as calculated by ORIGEN2 analysis code as of September 2011 is already down to roughly one megawatt for No. 2 and No. 3 plants, and down to roughly 0.8 MWt for No. 1 plant. The 83rd Carnival is now up at one of my favorite sites, the ANS Nuclear Cafe. This rotating feature not only is useful in giving a reader a glimpse of what each of us in the nuclear blogosphere is writing about; it also is a great weekly wrap-up of news items that may or may not have peaked on, say, the Google News page but nevertheless are of specific interest to people in the know. That last fact should be a good reason to check out the Carnival ... what the nuclear bloggers are saying is probably much more fact-filled and relevant than the FUD (Fear, Uncertainty, Doubt) pieces* you see in the mainstream media. Click here to get to Carnival 83 at ANS Nuclear Cafe. For those wondering about the Carnival and the upcoming Christmas holiday... there WILL be a Carnival 84 this weekend and it will be hosted ON THIS WEBSITE. That's right - Atomic Power Review is presenting the Carnival this weekend. If you have the time.. or if you have LOTS of time.. then make sure to look here because this feature will be uninterrupted by the holiday. Beginning with this post, Atomic Power Review will have a new post format intended to give readers a clear update of events accumulated over several days or a week. This new feature appropriately is called APR (no secret what that stands for) and is intended to be a simple review of events. Detailed posts with specific titles and covering specific events will continue. Fully detailed posts concerning the Fukushima Daiichi accident recovery will continue as well. Readers should also note that the APR Twitter feed (seen in a black background box on the right side of this page) serves as a good quick update news ticker - I often tweet things I do not post here. Further, I would always point readers to the auto-updating blog roll on the right, on which you can see the title of the newest post at a number of highly important nuclear energy blogs. JAPAN UPDATES ... This week, the Japanese Prime Minister announced that the Fukushima Daiichi plant's three damaged reactors had officially reached a state of "cold shutdown." This simply means that the reactors' temperatures overall are under 100C, and that the release of contamination to the environment is controlled (practically halted at No. 1 plant, whose reactor building is fully covered) to limit offsite radiation field exposure health risk to none above normal or background. While many sources are saying that this announcement is simply an arbitrary one designed to make it look as if the recovery is progressing faster than it is, the fact is that this step was actually announced in the recovery road map at the beginning as an important one and, now that it has been reached, or in other words the conditions to declare it satisfied, it's been announced and simply means the things I have described. The brief take on this is that the damaged cores are considered reliably cooled and that radiation exposure off site is negligible. It does not mean that all of a sudden a vast improvement has been achieved and should not be taken as an implication of this. TEPCO has announced that it may take up to 40 years to fully decommission the plants. This writer recalls that two competing consortiums were working to win a contract bid on the decommissioning, and that the going estimate at that time (some months back) was approximately 30 years. That figure was also used again in the Japanese press recently, but now it appears that at least informally TEPCO is beginning to push the estimate out a bit. Site operations at Fukushima Daiichi continue as before, very largely. TEPCO has experienced repeated but small leaks on its water cleanup equipment, prompting a stern warning from NISA and causing NISA to require TEPCO to essentially recertify its equipment and procedures. Readers may recall a prior APR post where I mentioned a discussion Dan Yurman and I had about the plant.. and you can be sure TEPCO will be patrolling the equipment in entirety on foot more often than every 20 to 24 hours, which we both agreed was just totally inadequate. TEPCO has made the observation that it is experiencing a fairly recent net intake of 200 to 500 tons per day of ground water into the plant buildings, and that this is adding to the total accumulation of water that must be processed and stored. UNITED STATES.... Perhaps the most encouraging news anywhere on the nuclear front is the report this week carried by a number of media and blogs that the Westinghouse APR1000 plant now has a majority of favorable votes in the Nuclear Regulatory Commission and that licensing for these plants is probably imminent. Two plants are actually under construction now at Plant Vogtle, Georgia (at least the foundation work is underway.) Combined construction and operating licenses for the two Vogtle plants, and two to be built at Virgil C. Summer station in South Carolina, may be issued by the end of the year after the full Commission vote. Vastly more prominent in the news this week, unsurprisingly, was the House Oversight Committee hearing which included investigation into the letter sent to the White House Chief of Staff by all four NRC Commissioners, accusing NRC Chairman Gregory Jaczko of quite a number of inappropriate behaviors that essentially (if true) amount to harassment and development of a hostile work environment. Certain allegations were also made that imply Jaczko's behavior may be worse toward women, and the behavior was said to extend not just to the four Commissioners but to senior NRC staff as well. He was also accused of withholding and/or controlling information provided to the Commissioners. Those are essentially the accusations; I have an opinion piece about this posted on this site which you can read by clicking here. That debacle briefly behind, Jaczko is now in Japan and will visit the Fukushima Daiichi site. Jaczko was quoted on NHK TV as saying that the achievement of cold shutdown status is a milestone. OPINION.... This writer feels that the action being taken by certain Republican members of the House of Representatives (read about it here) is probably a very good idea. The allegations made by the four Commissioners (Svinicki, Ostendorff, Apostalakis and Magwood) against Chairman Jaczko are serious and constitute abuse of power if true. Jaczko showed no remorse and admitted no wrongdoing, which makes it only clearer that his attitude is one of complete rigidity. Further, it was practically proven during the questioning that Jaczko thinks he is better suited to judge on safety issues than the other members. These however aren't the most troubling issues. After the Fukushima Daiichi accident, Jaczko assumed emergency executive power over the NRC - a fact that some Commissioners claim not to have known about until some time after he did so. This essentially removes the commission vote format and makes the Chairman essentially President/Chairman/CEO of the NRC. The problem with this is that the operating regulations state pretty clearly that this is to be done only when the emergency taking place is at a facility that the NRC regulates. NRC doesn't regulate anything in Japan; NISA does. So why did Jaczko assume power? It's a good question, and so good that the legal counsel for the NRC couldn't answer it directly in the afternoon Oversight Committee hearing. Frankly, this writer thought that the counsel's answer was garbage and probably legally unsupportable given the letter of the rule covering executive control of the NRC. Because there may be some wiggle room or ambiguity, several House members have decided to float around a bill to limit the NRC Chairman's position to just that - and not autocratic overlord. We can only hope, given an increasing amount of data on what might be an agenda for Jaczko, that this bill or else a rewriting of the 1980 act that directs the NRC's management scheme will be enacted. Atomic Power Review is proud to have been added to the link list at AREVA North America's fine blog, found by clicking here. We've naturally reciprocated the link. Since this site is a manufacturer (reactor vendor and a lot more, actually) site the blog posts vary widely in their scope but they can't be beaten for direct, accurate information "straight from the horse's mouth" as it were. Another interesting site I myself just found this week is Nuclear Australia. I will be contacting the owner for link exchange. This blog doesn't update as frequently as some, but the posts are very interesting- the most recent as of now concerning coal plants' radiation emission is noteworthy. In relation to the aforementioned AP1000 plant.. Westinghouse has, just this week, opened a new part of their website devoted to demonstrating the AP1000's capabilities in the face of a Station Blackout, or SBO event. This new visually stimulating presentation can be found by clicking here. Were anyone to have questions about whether or not real thought has been put into long-term SBO conditions, these presentations answer them. Finally, a note on video: The full House Oversight Committee hearing with Chairman Jaczko and the other four NRC Commissioners is listed as a 'favorite' at the APR YouTube Channel. Today's hearings by the House Oversight Committee in regards to the complaints registered against NRC Chairman Jaczko by the other four NRC Commissioners have ended... although there is a two week period before the record is published which allows some interviewees to receive further questions and give answers. -Chairman Jaczko does not believe he has done anything wrong, or at least will never admit to it. This is of course quite impossible given the complaints by all four NRC Commissioners, and complaints by NRC senior staff. Jaczko's continued but worn thin defense is his passion for safety - but belligerence masquerading as passion certainly seems to be the thrust of the questioning regarding his behavior at least so far as the Oversight Committee is concerned. -Given the complete lack of credible responses by the Chairman, this author is inclined to believe all of the allegations put forward by the Commissioners. Jaczko has only apologized for causing a distraction - not for his behavior. -Committee Chairman Issa essentially proved during the session that the behavior of Chairman Jaczko as described in the complaints constitutes harassment. Harassment cases at any private sector company are immediately addressed and assigned to Human Resources, but in this case Jaczko and apparently the White House feel as if the problem can be solved inside the NRC... thus leaving the fox in charge of the hen house once again, as it were. -Chairman Jaczko apparently, as a result of repeated and heated questioning, does in fact feel as if he is better qualified to determine anything on any safety related issues than the other Commissioners, even though he has no nuclear experience whatsoever. -Chairman Jaczko was clearly outside his legal authority to declare emergency executive control of the NRC at the time of the Fukushima Daiichi accident, since the accident was not at a facility regulated by or licensed by the Nuclear Regulatory Commission. This facility, half way around the world, is of different sovereignty (nationality) and as such is regulated by that nation's system; no emergency existed at the time at any U.S. facility and never has as a result of the Fukushima Daiichi accident. This point was made clear by Mr. Issa. -Most Democratic Party members of the Oversight Committee functioned essentially as expected, attempting to turn this into either a partisan politics issue or attempting to point the finger at the other four Commissioners who, it was implied, are in the employ of the nuclear industry... this, for example, is why (it was said) they attempted to hold up one or more NRC reports on Fukushima Daiichi. Author note: The reports on Fukushima Daiichi's impact will become important to be released immediately at any time, including all the way back to the date of March 11, 2011, when forty foot tsunamis become possible in the Continental United States. Other than this eventuality, which is total flood derived derangement of plant equipment, there is (and has been) no immediate threat at any time to any US nuclear plant as a result of exactly the same circumstances which have caused the Fukushima Daiichi nuclear accident. As a result of the above fact, attempts by the four Commissioners to review and correct such reports as the NRC 21 day Fukushima Report SHOULD HAVE BEEN ALLOWED. The contention of Jaczko (and his compatriot, Rep. Kucinich) is that the other members were attempting to stave off any post- Fukushima safety changes to protect the nuclear industry from cost or trouble. Later lines of questioning proved this to be a false accusation; the Commissioners have a responsibility to review and correct any materials produced, as stated by Commissioner Ostendorff. In the final analysis, it is this writer's opinion that Jaczko should either resign (which he will not do) or be removed. Jaczko could (as posited during the hearings) become a Commissioner once again, with one of the other members appointed as Chairman. At the very least, mediation and oversight must be put in place to stop any future behavior of the sort described today. As I said earlier, if this were a private firm HR would be all over this. Who serves as HR for the NRC? Labels: "hearing", "jaczko", "NRC", "oversight"
I have finally (thanks to A. David Rossin and some other new friends) finally seen an illustration from TEPCO indicating the cooling flow paths being used at the Fukushima Daiichi plants; it does appear now that TEPCO is using the core spray rings instead of the top spray as they had indicated before these second flow paths were added. 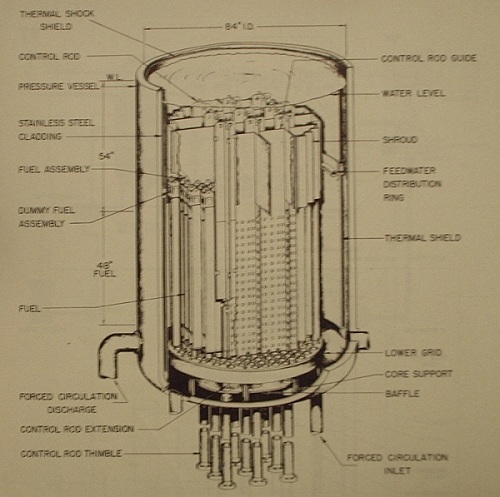 Below, an illustration of the GE BWR3/BWR4 reactor pressure vessel and attached and internal fixtures, marked up for this update. 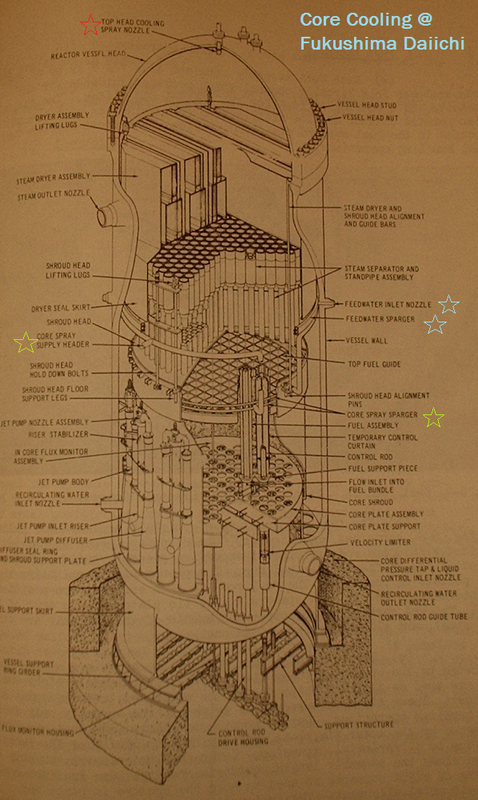 The blue stars indicate the location of the normal feedwater flow path; feedwater is introduced through a nozzle in the pressure vessel and is supplied to a ring ("sparger") which directs the feedwater flow downward, all around the outside of the core barrel. The yellow star on the left side of this illustration shows the nozzle for connection of the core spray; that on the right shows the location of the core spray ring. This is the added flow path being used at at least one or all of the plants, as indicated in a November 30 TEPCO illustration I've just seen this morning. 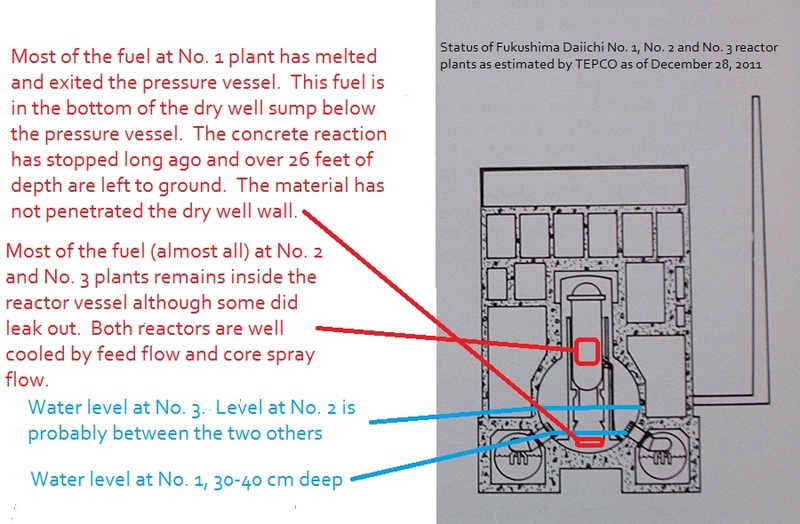 On the top of the illustration we see a red star by the top spray connection; TEPCO had previously indicated that this would be the second flow path, but clearly the core spray ring is more logical. It's important to note that the feedwater sparger is OUTSIDE the core barrel and that the core spray sparger is INSIDE the core barrel. This makes the core spray far more effective in directly cooling the core ... so long as the core is mostly in its original location. One of the things that this author is still wondering about is the recirc pump seals. If the recirc pump seals are failed and leaking, then this will provide a leak path out of the reactor vessel essentially at the height of the jet pump standpipes. This would make it hard to keep water level higher than roughly 2/3 of the normal core height by feedwater flow alone. There are some further developments regarding TEPCO press releases that I'm just now aware of and will update on those later on today. There is little significant news coming out of Fukushima Daiichi, at least in terms of the number of reports. Two of the few reports are, however, of some note. -NISA has taken some serious action against TEPCO as a result of several decontamination / desalination system water leaks over the past week, issuing a Serious Warning to the utility and essentially forcing TEPCO to rewrite the standards by which it is given license to operate its water cleanup systems. This is almost like relicensing, but without a forced interim shutdown of the equipment. -TEPCO now estimates that there is something like as much as 500 tons per day, total, of ground water at the Fukushima Daiichi site leaking INTO the turbine buildings. This is causing a faster buildup of water onsite than planned. TEPCO would like to release some low-level contaminated water to sea, but as of today Yukio Edano has said that TEPCO will have to get permission from fishermen's groups in the area before it discharges any more water. This writer wonders just how long ground water has been leaking into the buildings, and what effect overall this has had on the operation since the very beginning. Surely each aftershock after the first quake had the opportunity to further breach the buildings' basements, allowing possibly more groundwater to get in. TEPCO has released the second video of the third series in its coverage of the recovery effort at Fukushima Daiichi. This third series covers measurement of radiation, and radioactive material emission at the site; the newest video, rather longer than usual, contains detailed information about how TEPCO is measuring the particulate emission from the three damaged reactor plants (each situation is different). The complicated considerations and calculations are very well covered. CLICK HERE to access the APR YouTube Channel. The nuclear term SBO has begun to get into the usage of some of the general public as a result both of the Fukushima Daiichi accident and as the result of a few storms in the United States in the last two years that resulted in brief SBO conditions (but of course in the US, the diesels started, ran and kept running in every instance.) SBO stands for "Station Black Out" and refers to a total loss of all AC power being supplied to the nuclear power plant site from outside the plant. Westinghouse has today released a very excellent presentation on its new AP1000 nuclear plant's abilities in an SBO situation. This is important as AP1000 plants are actually under construction right now not only in the United States but in other countries. Advocates of reactor safety (and aren't we all?) and those interested in the overall SBO mitigation strategy will find the link below of great interest. Labels: "AP1000", "blackout", "reactor safety", "SBO", "westinghouse"
There are so many posts on line and articles extant at the moment about the previously hidden, but now well exposed management situation at the Nuclear Regulatory Commission that it would be difficult to sum them all up. Further, it would be hard to fully describe all of the events in one brief and easily read post, so I will simply sum up the events until this point. -There is also alleged a policy of withholding information from commissioners, on the part of the Chairman, for the purpose of controlling decision making. -It is a fact that the Chairman holds the position of Chairman solely and completely as a result of political and not operational considerations; Jaczko has absolutely no nuclear plant, nuclear engineering or nuclear energy administration experience whatsoever (prior to appointment as a commissioner due to political leverage, and later politically as NRC Chairman.) The plain fact is that Jaczko was formerly associated with Senate Majority Leader Harry Reid, and was placed in position of Chairman by President Obama after having been a commissioner. It should be kept in mind when reading the above fact that the Federal Government is and has been for many years legally obligated to provide such a long term storage facility, in order to get HLW off the sites of owner-operators (i.e. the nuclear power plant sites themselves) and has totally failed in this obligation. Jaczko's killing of the project study is thus especially troubling in light of the fact that no alternative was prepared, or even suggested. -There is now political tug-of-war at play, as Democrats (Rep. Markey) try to demonize the four other NRC commissioners for damaging the NRC's work and thus nuclear plant safety (a ridiculous accusation, and baseless) and as the White House has issued a letter of apology written by Jaczko who states that he will reach out to the other commissioners and will keep them more in the loop as it were. -This all comes in advance of a House Oversight hearing on this NRC management problem tomorrow at 10 AM Eastern. Surely, some or all of the response by Jaczko, the Democrats (variously) and the White House is meant to stem the onslaught of accusation and presentation of fact that would make Jaczko look bad at tomorrow's hearing. The above basically summarizes where we are on this whole NRC "event" at half past one in the afternoon Tuesday, December 13. I will now offer some of my own personal opinions on this subject and on Jaczko in general, for whatever they are worth. 1. THE NRC NEEDS TO BE EXCLUDED FROM THE POSSIBILITY OF MAKING NATIONAL ENERGY POLICY. Jaczko himself seemingly quashes any discussion about Yucca Mountain any time it is brought up; a good example of this was the NRC webinar in which this author took part a short time back, which was presented by the work of the ANS and moderated by my friend Dan Yurman. In that webinar Jaczko said that Yucca Mountain was a non-issue as it was dead, and that the NRC essentially served as an appellate court of sorts to decisions relating to licensing board activity. Thus, Jaczko clearly believes that the NRC is in the business, in a back door sort of way, of dictating national energy policy. The NRC's job should be simply that of a regulatory agency; it should perform licensing and oversight functions only and leave energy policy to lawmakers. Any and every effort, up to and including a clear re-writing of the NRC's charter, should be made to prevent any NRC decision from killing a nationally (federally) mandated project or review. Part of the reason the AEC was split up was that whatever project the AEC wanted, it got; this does not mean that the NRC has the option of killing any and every project it wants to kill. We have swung too far the other way. 2. NO SAFETY IMPLICATIONS HAVE OCCURRED OR WILL OCCUR AS A RESULT OF THIS ONGOING SITUATION. In point of fact, the NRC under Jaczko has been almost completely obstructionist in terms of licensing new nuclear plants. As pointed out some time back by fellow blogger and nuclear professional Rod Adams, the NRC has never approved and licensed any plant whose design process began after formation of the NRC. In other words, all the licensed facilities were begun before the NRC was created. Thus, its rate of approval is presently zero. It would be difficult to believe that there is any safety implication, thus, in the licensing of new designs. Further, when there were some questions the NRC Chairman had about the AP1000 design and which were not apparently answered to his satisfaction he decided to go wholly public with this information, possibly damaging the market position and business potential of a major nuclear equipment manufacturer. If this had occurred by statement of a private citizen, potentially many millions of dollars worth of slander lawsuits could have been filed. Certainly, no NRC or AEC action has been so public before; they are always resolved internally. Jaczko further exacerbated matters by saying more or less that he felt he can use any and every method available, and would do so again. Seeing all this it's impossible to believe that things are "getting by" the NRC or being rubber stamped by it. In fact, it's the opposite, apparently (according to the accusations) thanks to the Chairman in no small part. 3. THE NRC CHAIRMAN MUST BE SELECTED BASED LARGELY ON EXPERIENCE IN THE FIELD AND NOT SIMPLY BY POLITICAL AFFILIATION OR MANDATE. It seems clearer all the time that Jaczko's purpose at the NRC is wholly politically motivated, especially considering the sharp Democratic responses to the common complaint (from all four other commissioners) of his problems. If it were only Republican-appointed people complaining about him in the first place, we might see the complaints and rebuttals purely as political... but it's everyone. It's very easy to see that this might be alleviated to some extent if the Chairman had nuclear industry experience to back up decisions - but he does not, so we have instances where Jaczko feels the need to force post-Fukushima changes onto plants where they're clearly not required and then uses his demeanor or any other method* to shout down or suppress any opposition. The plain fact of the matter is that the direct cause of the Fukushima Daiichi accident was a forty foot high tsunami; thus, the only immediate changes we need make in the United States are to those plants possibly subject to a similar disaster. An NRC Chairman with experience would know this. I can of course go on for hours about why someone in charge has to have experience and be able to do the jobs of those he leads, but that's Business Management 101 and I won't bother to repeat any of that here. * At the webinar, the NRC Chairman hinted that the budget might get tight in the future, and that some real decisions might have to be made about whether to develop post Fukushima alterations or proceed with licensing. This makes it sound as if the Chairman is willing to use budget constraints to leverage the changes he wants with the threat of licensing (or re-licensing) holdups. I could go on, but if we look at what the other nuclear bloggers have written I'm in majority agreement. I thought I would write a few things I had not seen elsewhere in detail. What we are really waiting for now is tomorrow's hearing and webcast. There is sure to be more political damage control attempted between now and then. I will decide for myself, after tomorrow's hearing, as to whether it's time for Chairman Jaczko to get out of town or not. With the winter practically upon us (we're expecting our first significant snow here in Northern Ohio tonight) it's time to finally put the golf clubs and lawn chairs away for another cold season. This means that I get to catch up on my intended reading a little faster; I thought I might give my readers a little look at what's in the queue. Of course, I have a giant pile of Westinghouse / Syl-Cor fuel and reactor design material still to read and catalogue, but that type of thing can be fit in and around other tasks - it's something I can put down, and walk away from for a while without really losing my place. That is, so long as I stick to one section of the archive at a time. Many website articles will come from this material. -This volume is a compendium of papers prepared for a special ASCE conference on the titled subject which took place December 17-18, 1973 and which was sponsored by the Nuclear Structures and Materials Committee of the ASCE. The vast majority of this volume's content focuses on seismic issues. -Probably one of the leading books in its field; I have flipped through, referenced and consulted this volume before but have not read it through cover to cover. There is a chapter on accidents (which includes yet another brief TMI narrative) but this volume's promise lies in its completeness of coverage of the environmental impact of all conceivable byproducts of nuclear plants. -This large (approximately 800 page) volume covers all then-known experience with decontamination of equipment involved with nuclear reactor operation, which is its stated purpose. While the information is certainly dated, this period of nuclear history is of great interest to me and it is certain that certain known reactors and events will be referenced in this volume in perhaps previously unknown ways. -This book actually came from the AEC Library; it bears the identifying stamps. This book takes a look at most of the serious proposals extant at that time for the use of nuclear energy either simply for large scale water desalination, or else for dual desalination / electric generation. Considering the fact that this book was written right before the practical wholesale cancellation of all such efforts, it represents the state of the art as it left off; further, considering that many nations now may consider use of nuclear energy for desalination (perhaps in the Middle East) it may be a topic likely to be revived, even if on a smaller scale than developed in this book. Here, then, we have four fairly large books I intend to plow through while the snow flies. There are more that I may add to the list, but this is enough for now considering all the other things on my plate- including Nuclear News, the daily NEI e-mail brief, a hundred ANS Social Media e-mails a day, hate mail from my "fans" on Atomic Power Review and probably a dozen more different sources. (That's just the required daily reading part.) I will report on these books from time to time; if we have a blizzard or two, that will certainly help my progress. Process water leakage at Fukushima Daiichi, and power lunch! I've been following this story since it first broke, waiting for some concrete details to emerge. Now that there are some, I will report. A couple of days ago TEPCO discovered that a major system leak had occurred in the desalination plant ("evaporative condensation plant") building at the Fukushima Daiichi site. The plant had not been inspected visually by walkdown in 21 hours. TEPCO indicated that it believed as much as 45 tons of water had leaked out. Today, I had lunch with Dan Yurman (and had a great time) who is the author of the Idaho Samizdat blog, a frequent contributor to the ANS Nuclear Cafe blog (which he helped to launch for ANS personally) and who I consider a friend. We talked about this, and I mentioned the 21 hours since walkdown which I thought was ridiculous. Dan has a lot of experience with this type of equipment and noted that it should be walked down every several hours because there will be leaks. The trick is to find them and fix them before this kind of thing happens. My experience is in light water power reactors, and I certainly can back up having watchstanders looking over all operating equipment continuously as being absolutely necessary. Someone dropped the ball on this, whether it's TEPCO or one of its contractors... that much is certain. We did some calculations on the stated release figures and got a number of around 12,000 gallons that might have leaked. This water got into the process building, leaked out under the walls and then got to the outer area around the building. TEPCO today has a press release out stating that while the total amount was fairly large it believes only about 150 liters or about 40 gallons / 300 pounds of this 45 tons (we figured long tons) actually got into the water, with negligible effect. Even with the tiny effect this would have on the environment and on the flora and fauna, TEPCO once again has egg on its face as it were. This is most unfortunate from a PR standpoint as it surely undermines some of the credibility TEPCO has been gaining in its response to the accident and its transmittal of clear information as soon as it has any information. Cooling to the reactors was never affected. Cooling of the spent fuel pools was never affected. Access to the reactor plants and their support equipment was not affected. Postscript: Dan and I also talked about some of the wacky anti-nuclear garbage out there on various sites. For the record, as I've said before: No one is building or trying to build any sort of core catcher under the Chernobyl No. 4 reactor, and no one would try to do so under Fukushima Daiichi. There is no China Syndrome occurring, and as I pointed out during our talk (and Dan agrees) you'd be into the water table at Fukushima if you tried to dig under the plants. This is just more nutty scare talk being furthered by people too emotional to learn fact or discern from flights of fantasy. Dan finds the whole notion of "hydrovolcanic explosion" as preposterous as I do... this being a supposed condition about to occur at Fukushima Daiichi. At least, it is if you read articles written by scaremongers who have no idea what they're talking about. What's most important though is that Dan and I had a good time (this was our second meeting) and we plan more in the future. "I am a consultant to firms in the global nuclear energy industry in the area of social media and marketing communications. I launched ANS Nuclear Cafe, the blog of the American Nuclear Society, in 2010 and the Facebook page of the Idaho National Laboratory in 2009." Having said this, it should be noted that many people work on the ANS Nuclear Cafe blog both with bylines and behind the scenes... and it's their work and Dan's that gives us such a great venue to read. Dan Yurman has posted the 81st Carnival of Nuclear Bloggers over at his fine blog, "Idaho Samizdat." APR's post on the December 2 anniversary date for nuclear energy history is included in this Carnival as are quite a number of other very fine articles worth reading. Click here to get to Carnival 81 at Idaho Samizdat. 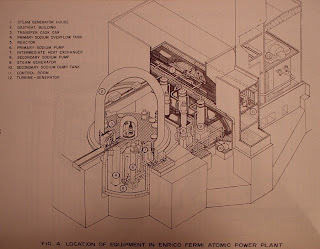 Last week, faithful reader and commenter (on this and many other nuclear blogs) James Greenidge made the note to me that December 2 was an important anniversary - the anniversary of the very first criticality of the first nuclear reactor - Enrico Fermi's "atomic pile" near Chicago. At that time I decided to make a post with some details. However, I saw earlier today that the American Nuclear Society's blog had declared today to be "Atomic Power Day" since - as it rightly points out - the Shippingport Atomic Power Station, our first commercial station, went to full power in 1957 on the same December 2 date. 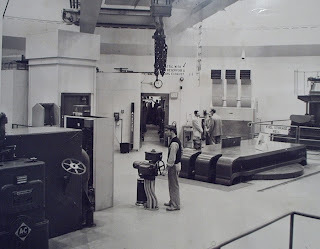 There's also the first electric power generation at EBR at NRTS, in December 1951. In rough addition in the atomic power timeline, I add that General Electric first announced the construction of its Vallecitos Atomic Power Laboratory in December 1955; it was later to be the first atomic station to commercially deliver useful power*. Also in December.. but December 1961.. the nuclear powered ship N.S. Savannah's reactor first achieved criticality. So we can make a really good case for nuclear energy in a number of ways for the month of December... and next month we'll have the National Nuclear Science Week. This day is also important to Atomic Power Review, because it's the day that this blog's page views will pass the 200,000 page views mark. Anyway... let's get to the presentation. 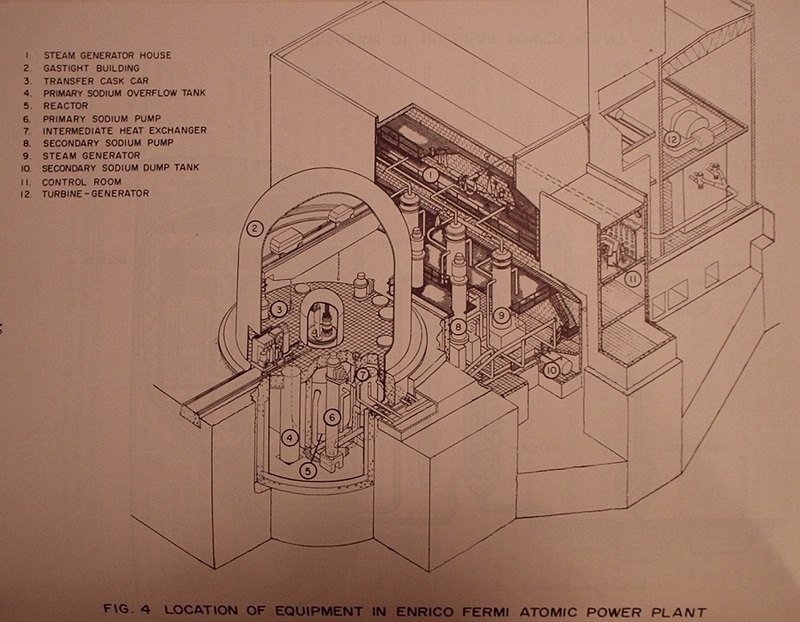 Much is available online about Enrico Fermi and his first "atomic pile," which really was the first nuclear reactor. Here are some technical details about that first pile. 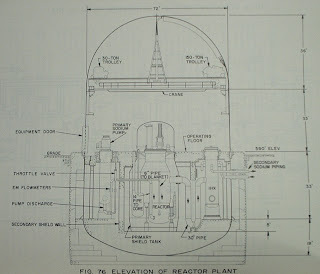 The reactor was originally not given any sort of designation but later came to be known as CP-1 for Chicago Pile 1. The core size was 24.5 feet by 24.5 feet square, by 19 feet high. It contained 385 tons of graphite in the form of blocks. The fuel for the pile consisted of 12,400 lbs of uranium contained in 80,590 lbs of uranium oxide (both UO2 and U3O8.) There was no coolant employed of any sort; there was also no shielding although a one foot thick graphite reflector surrounded the core. The core had a maximum power rating of 100 to 200 watts, although at first it only operated at one half of one watt. 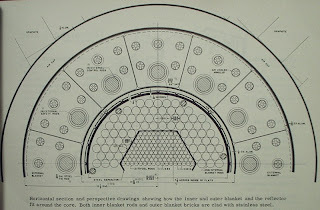 The reactor gave off enough radiation that the whole concept was reengineered to include shielding. 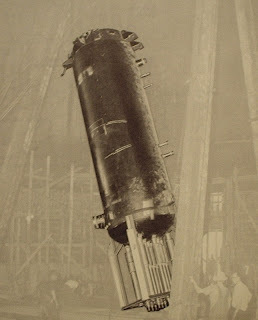 The core was totally disassembled and later reassembled in another location with shielding and some considerable alteration as CP-2. Of course, Enrico Fermi was at the lead of the men who built this first reactor and while he achieved very much more in his career, we may all today also remember most vividly the nuclear power plant which bears his name - the Enrico Fermi Atomic Power Plant, which originally included an experimental sodium cooled breeder reactor and which today houses a single GE boiling water reactor plant (although another BWR was under consideration, but stopped.) Let's take a look now at some rare illustrations from our collection here. 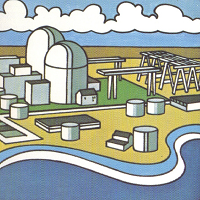 Above, an artist's conception of how the Enrico Fermi Atomic Power Plant would appear when completed. This is from an APDA/PRDC publication, which is the 1955 project progress report published March 1956. Above, Fermi-1 as completed, from the other side and with the visitor information center in the foreground. Post card in APRA collection. 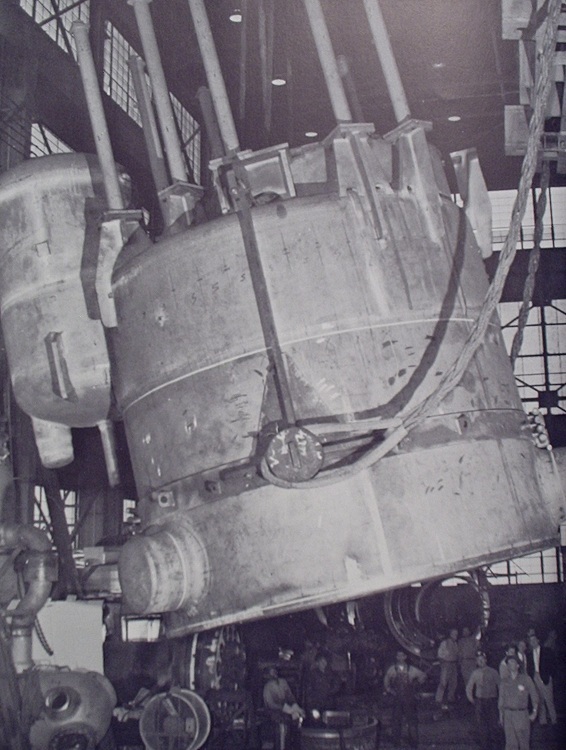 The reactor vessel for this plant was unusually complicated and was said to be the most difficult vessel fabrication ever attempted (not just including nuclear reactor pressure vessels.) The vessel was fabricated at Combustion Engineering's vessel shop in Chattanooga, Tennessee. 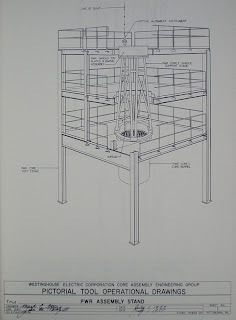 Below is an illustration of part of the vessel under construction at C-E's shop, from the 1958 Atoms For Peace / Geneva pictorial illustration book assembled by the AEC. The complicated shape of the vessel coupled with the requirements for metallurgical stability and strength in a high radiation flux are what made this piece so difficult. 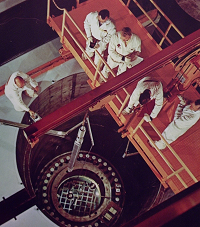 Here we see the vessel installed in the reactor building at Fermi-1. This illustration is from publication APDA-124, published January 1959 by APDA to act as a detailed technical description of the entire power plant. To give a perspective of this installation we offer the following illustration, also from the same volume. And also from the same volume, a view of the entire atomic power station. 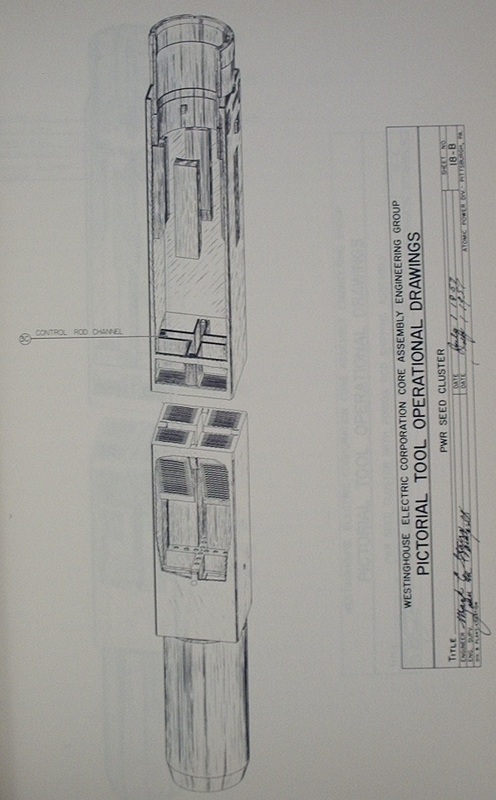 Item: Close inspection by sharp eyed viewers may reveal the installation of a "centerline at floor level" turbine generator set, a design then still new as a product of Allis-Chalmers Manufacturing Company. A-C was one of the many members of the APDA consortium. 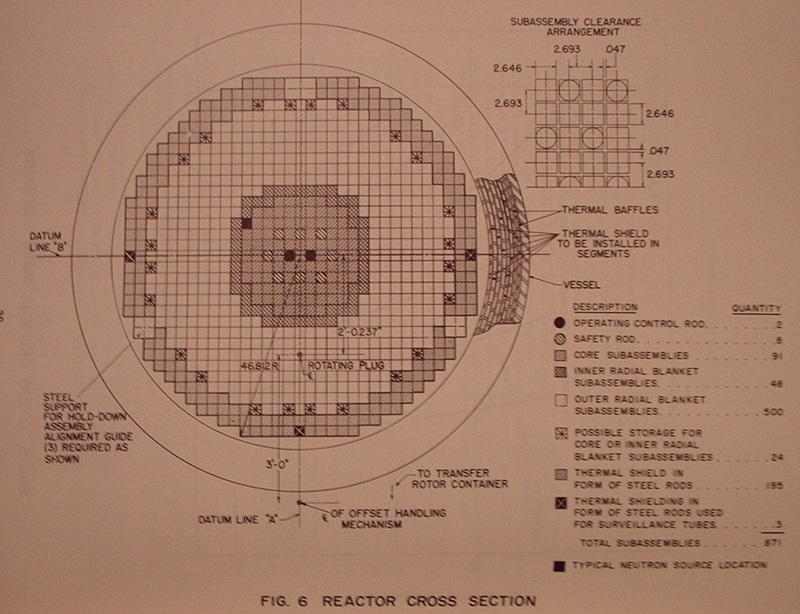 Fermi-1 was as we all know a breeder reactor; without getting into technical details, I offer (also from APDA-124) the following illustration showing the core arrangement. This drawing blows up very large to allow reading of the legend. All of the illustrations on today's post are actually fairly large. We can see the different zones in the core here at Fermi 1... an odd parallel to our next and final subject, suggested by ANS Nuclear Cafe's post today. That subject is the Shippingport Atomic Power Station. 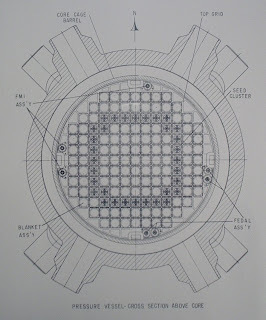 Shippingport (often called the PWR project) was unusual in many ways... two of them were the use of a seed and blanket core (highly enriched seed elements with control rods cause fission in unenriched blanket elements without control rods) and the fact that the plant was constructed mostly below grade. Let's take a look first, briefly, at the plant arrangement. 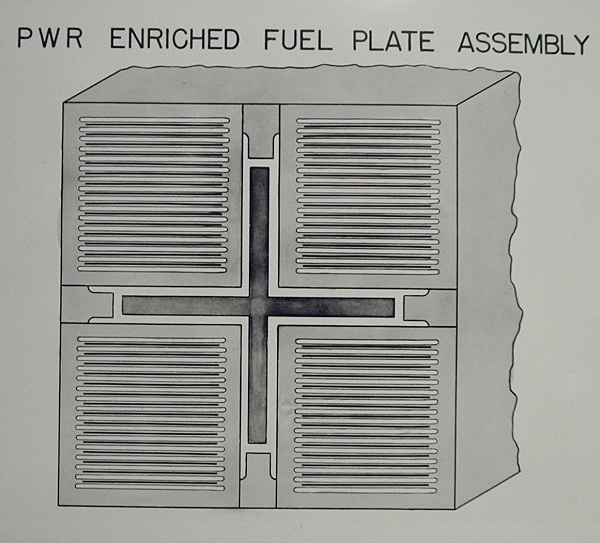 The next two illustrations are from the PWR Simplified System Schematics binder in the APRA collection. Above, we see the reactor plant and the support buildings.. the turbine generator was actually located outside, in open air (much like San Onofre 1) and is not shown. 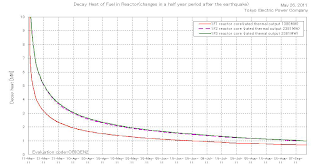 Note that the reactor plant containment is almost totally below the grade. Below, we can see overhead and cross section views. 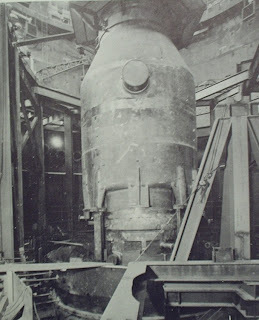 The center chamber, mostly spherical, housed the reactor. Two identically sized chambers housed the four coolant loops with one main coolant pump and one steam generator each. 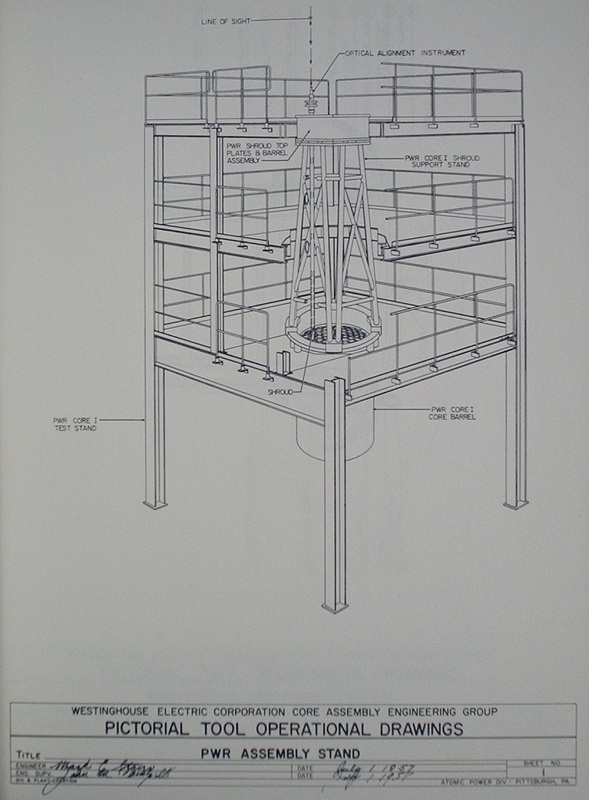 The large auxiliary chamber housed the pressurizer and other primary equipment such as coolant cleanup and sampling. Next, we look at the core from above to see the arrangement of seed elements and blanket elements. This is taken from our complete press release package which was sent out by Westinghouse / Duquesne Light at the time the plant went into full operation. 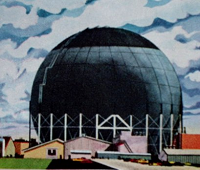 Let's now get into some very rare illustrations, acquired from the estate of the late James Vadeboncouer, who worked for both Westinghouse Atomic Power Division and later Sylvania-Corning Nuclear. Mr. Vadeboncouer was working at Westinghouse when the PWR core (Shippingport) was developed and there is much rare material in the many boxes on this core. First, let's see a cross section of one of the highly enriched seed elements. This is Westinghouse Atomic Power Div. negative number 13688. 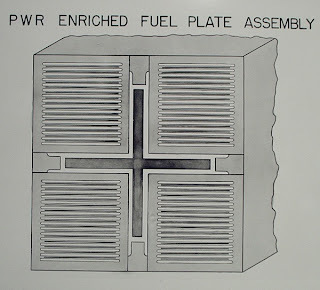 We move over from a selection of WAPD photos to the "PWR Core 1 Core Assembly Engineering Tool Operational Manual," WAPD-NCE-5215 (July 1957) to see one of the seed elements in complete view. This manual really was meant to cover the tools and fixtures needed to fully assemble the core prior to installation in the plant. Below is a complete view of the assembly stand developed by WAPD. The blanket assemblies used not plates but fuel rods. Let's return to the group of photos in the folder labeled "PWR Specifications" for a couple of rare views. These are actually fully labeled so they need no explanation from me. The support plate for this core was complicated, because the core was so highly instrumented and because it contained a FEDAL system (Failed Element Detection And Location.) Here are a couple of views to finish us off for today from this same folder which show the core support plate in the process of fabrication. Without getting into detail, I will add as a final note that the FEDAL system contained a complex valve that sequentially ported water from a wide number of tubes in order that they could be sampled for detection of fuel element failure; this rotating valve was driven remotely by a then-standard commutator-inverter continuously unless a particular sample line were desired in which case it could of course be stopped. That about covers our little photographic walk down the path of yesterdays in honor of "Atomic Power Day." Thanks to ANS Nuclear Cafe for declaring it and for giving me the idea to expand upon my original post idea to include Shippingport. * - General Electric essentially continued to try to one-up Westinghouse at all times following Westinghouse's success with the STR (S1W/S2W) PWR plant developed for USS Nautilus and after announcement of the PWR (Shippingport) project. So while Shippingport was the first commercial station to be planned, designed and ordered, GE beat them to the punch by a couple months (in terms of commercial sale of nuclear generated electricity) with the small experimental Vallecitos plant. GE had tried to make hay earlier with a big to-do at the S1G plant, Kesselring Site, West Milton, New York onto which it tacked a roughly 10 MW turbine generator and tried to sell power to Niagara Mohawk. This PR stunt did little in retrospect. GE redeemed itself fully however with the totally privately funded Dresden-1 plant only a couple years after Shippingport went on line. Labels: "fermi", "PWR", "shippingport", "westinghouse"